I am sure that every computer user appreciates new applications which increase the accessibility of the programs we use most. Some of these programs let us create custom hotkeys or assign various mouse actions to specific tasks/files/folders. But recently I discovered an application that lets us make maximum use of our desktop by placing the most use applications there. The program I am talking about is Stick. Stick is a freeware application for Windows and its download size is about 4MB. The program sticks different programs as tabs to our desktop. The offered program within Stick include a basic calculator, a calendar, an explorer (which can explore our system files as well as browse websites on the internet), a news feed program/tab, a taskbar, and finally, a Notes tab. Here is how my desktop looked when I opened all applications and put them on the desktop, aligning them to a certain edge. I hope you can see from the image how everything is neatly placed on the desktop. We can drag these tabs to reorder them. We can also choose to exclude (and then re-include) certain tabs. 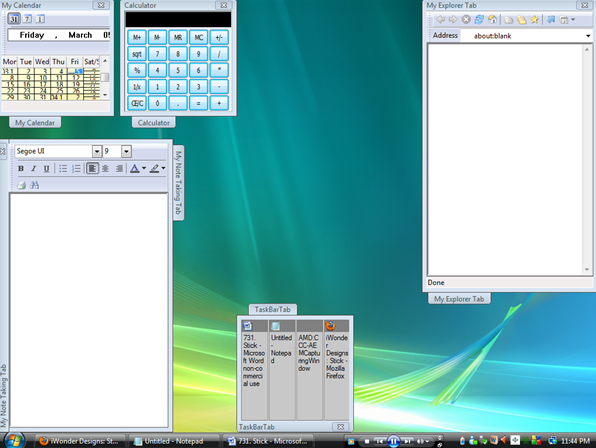 We can even add more than one tab of each type of program which will be independent of each other; for instance, I can choose to add two calculators on the desktop and their calculations will be independent of each. 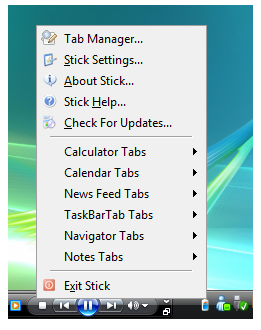 We can do this by accessing the options from Stick’s icon in the System Tray. Overall, Stick is a tool which many users will appreciate for it makes the most used Windows tools more accessible. Do you agree/disagree? Do you know of a better freeware alternative that performs the same task? Do let me know in the comments. Previous Entry: Will iTunes move to The Cloud?